Ron Hodgson is a decorative furniture dealer, deals in a wide range of decorative vintage and antique furniture. He specialises in French and European 20th century armchairs and sofas sourced direct from Europe from established dealers. He has an eclectic array of 20th century design furniture, industrial lighting, decorative items, taxidermy, railwayana and enamel advertising which may be viewed at his premises. A lot of items are sourced on commission for clients, interior designers and architects. Ron travels throughout the UK to personally source items and will be happy to find items for you. 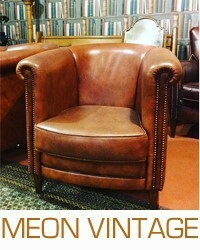 MEON VINTAGE to provide own terms and conditions. Consumer Contracts Regulations apply.